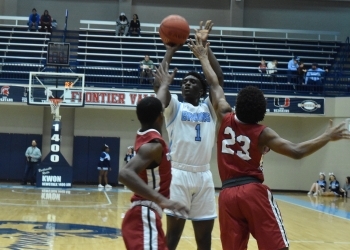 Bartlesville High tipped off its season against Owasso on Tuesday. It was a split night, with the Lady Bruins winning and the Bruin boys losing. On the ladies side, Bartlesville used a big run in the third quarter to put Owasso away by 14, in a 46-32 victory. BHS led by only five in the second quarter until Chloe Martin hit a three-pointer at the buzzer to put the Lady Bruins up by eight at the break. Bartlesville would then outscore Owasso by 14 to begin the fourth quarter to lead by 22. The Lady Rams did not ever threaten the big lead, although they did cut into it. Bartlesville has now won six of its last seven games against Owasso. Donnie Martin picked up his first win as Lady Bruin head coach. He talks about the victory. Jena’ Williams and Martin led Bartlesville with 13 points apiece. Elise Cone added in eight. BHS took the air out of the ball at the end of the game and did not score in the final four minutes. On the guy’s side it was a roller coaster of game with Bartlesville leading throughout, but ultimately losing to Owasso 65-58. The Bruins built a 13-point lead midway through the third quarter thanks to hot shooting from Jaylin Oliver and Tayo Dina. This Dina three gave the Bruins their biggest lead of the game. The Rams would outscore Bartlesville 30-10 over the final 12 minutes of gameplay to pull away. Dina ended with 24 points to lead the Bruins. He had 18 at half he also finished with a double-double unofficially with 11 boards. Oliver finished with 20. Both Bartlesville teams are next in the Broken Arrow Tournament on Thursday. BHS girls play Hale at 10:00 AM. We will carry that game on 99.1 FM - 1500 AM - KPGM. Meanwhile the Bruin boys will play at 5:30 PM against East Central. We will carry that game on KWON - AM 1400 and FM 93.3.